The conviction has been growing in me for quite some time that the really big deal about global warming is increasing frequency and severity of droughts. If I've succeeded in convincing you of this too (or you already believed it for other reasons of your own), then you will be interested in a new paper by Wehner et al (a group of scientists at NOAA and US national labs) titled Projections of Future Drought in the Continental United States and Mexico. The full paper doesn't seem to be freely available on the Internet but there's a press release and also conference talk slides that will give you the flavor. Furthermore, a reader sent me a copy and I'll summarize the points that interested me here. Let me start by explaining the figure above which is really the heart of the paper. The x-axis of the figure is time during the twentieth and twenty-first century. The y-axis plots the fraction of the area of the US and Mexico that is in at least moderate drought (PDSI less than -2). The red and black lines are based on two different estimates of the historical PDSI: both use the same code for generating the PDSI that NOAA uses for its regular drought monitoring but they use temperature/precipitation data series from different groups as the input to the PDSI calculation. 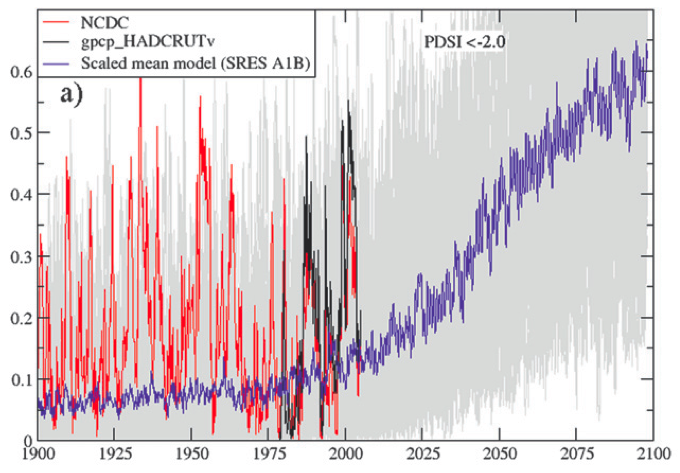 Then the pale grey lines represent the (corrected) PDSI from nineteen climate model runs used in the IPCC AR4 process with the A1B emissions scenario (the world is currently tracking noticeably above this scenario). The purple line is then the average of the 19 model runs (ie all the grey lines which are too blurred together to really see well). Because the purple line is an average of 19 simulated worlds, it has much less fluctuations in than the one real world (red/black lines). 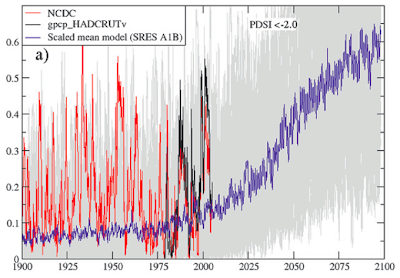 Also, because climate models seem to systematically under-estimate drought in the twentieth century, the purple line is below the red line on average. 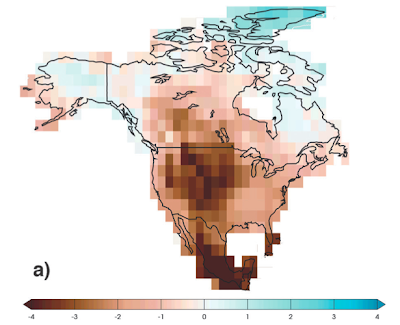 These models showed that the normal state for much of the continental United States and Mexico in the mid- to late-21st century would be conditions considered severe to extreme drought by today’s standards. One interesting thing is that this new paper does not cite, and shows no awareness of, the line of papers by Dai and coauthors that I have covered extensively on this blog. While that's a flaw in the paper, it does mean that the broad conclusions of those papers have been reproduced completely independently by a different group of scientists. Needless to say the conclusions here are terrible - if there is that much drought on a regular basis, lots of US forests will be turning into savannah (and savannahs into grasslands or deserts) and there will be huge releases of carbon dioxide from the biosphere - really nasty positive feedbacks that the climate models I'm quite sure are not capturing properly - and we are really going to turn our beautiful planet into a hell fit only for robots to live on. 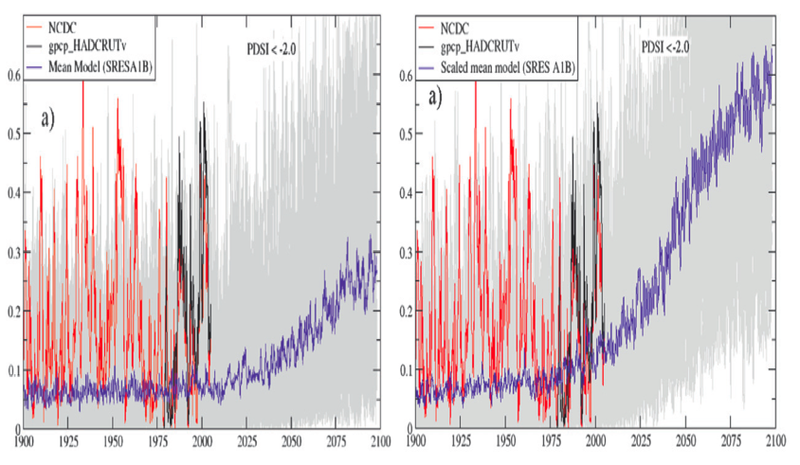 This shows the change in the average PDSI in the models regionally. Note the scale - the dark brown is a full -4 shift: the new normal will be extreme drought by the standards of the past. So if this map is right, you can basically kiss Mexico goodbye altogether and the mountain west and great plains look terrible too. However, I wouldn't necessarily see the map as very certain for reasons I'll discuss in a moment. Is there any escape from this conclusion? The first thing the researchers noticed is that the models have a tendency to predict too much rain and not enough heat in some parts of the country. So they took the temperature and precipitation for each model, and for each simulation grid cell, and rescaled them so that the average over the twentieth century matched the actual average in the real world. Then they reran the PDSI calculations and that's the picture on the right (which is also the one at the top of the post). You can see that this adjustment hasn't really solved the problem in the twentieth century - though it's a bit better - but the prediction in the twenty-first century is pretty sensitive to this adjustment. Presumably, the real problem is that the climate models aren't very good at producing the kind of long hot rainless summer that gives rise to killer droughts (like in Texas in 2011). The rainfall and temperature in the model probably lack sufficiently long auto-correlations to produce real world droughts. Still, just adjusting the model output to have the correct mean values before doing the PDSI doesn't seem like a crazy thing to do: although it's crude, it's hard to argue that it invalidates the right hand side figure. Still, the fact that the models clearly fail to capture the most important dynamics of drought should give one some pause. 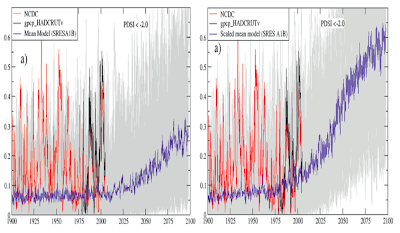 Pretty much all the models predict more drought - that's a robust prediction that arises because the increasing temperature produces more moisture demand on the soil than the precipitation can supply, even where the latter is increasing. However, one story you might try to tell about how it might not be so bad: suppose climate change makes the weather less correlated (ie more changeable) so now it becomes very unlikely to have an entire hot summer, but instead you get a hot week or three and then a bunch of rain and cooler weather and then back again. That might produce less drought even in a warmer world, but climate models simply couldn't credibly predict this trend (or the reverse) since they do a rotten job of predicting the level of drought now. Of course, there isn't the slightest reason at the moment to suppose the weather is going to get more changeable under anthropogenic climate change - it's just a place where you could park some doubt, if you really didn't want to believe this stuff. Right now, it looks a lot more likely that we really are headed into a future with a lot of killer droughts. More research desperately needed. And more action on climate change from individuals and politicians too. Please. How does that jibe with the Hadley Cells moving North? My understanding was that the Northern Plains have been uncommonly wet the past decade or so. I was actually kind of thinking that might be the new normal for them. One thing I should have mentioned but didn't think of until later - the idea that the weather could get more changeable and thus mitigate drought trends isn't very promising in light of the Hansen et al paper I discussed a couple of weeks back. There it was shown that the distribution of average June-July-August temperatures is broadening as well as the mean shifting to the hot side. That suggests that empirically that long hot very dry summers are getting more common not less. Sunbeam: I should have mentioned that. The general idea is that the drought trend in the US is not yet clear enough to have risen out of the considerable natural variability. That is the position of this paper, and it's consistent with the Dai trend map (here) which shows a slight wetting trend in the US the last sixty years. On a global basis (where the natural variability is averaged away better) it seems to be clear already that there's a drought trend (eg the first principal component of the PDSI field seems to be clearly consistent with an anthropogenic warming story). And all analyses of the climate models suggest that the US will not be spared this fate in the long haul. Even if the weather were to be more changeable as the climate warms, there is no comfort to be had. Thomas Homer-Dixon, I think it is, points out in The Upside of Down that in many arid regions erosion is caused by water movement. As well as drier drys, warming is expected to bring wetter wets. When the rain comes it comes hard and removes topsoil as it runs off. A weather pattern of four months of dry followed by four or six inches of rain falling in 2 or 3 days would on average have a climate able to support agriculture. But in practice most of the rain would run off the dry surface, taking topsoil with it once it picks up speed. My guess for why it is the Colorado-Montana-Nebraska-Dakotas region that is projected to dry most is orography. With less snowfall on the Eastern side of the Rockies, and an earlier and quicker melt, there would be less stream-flow through these states in the growing season. The area has been dry when warmed in the past. Stuart Staniford turning to Joe Romm??? I haven't read the original papers. But what does these graphs and maps mean on a more basic level? I can look at the map and say that agriculture is finished in most of the United States. Is that an accurate statement though? Could you still make a go of it in Iowa growing a less thirsty crop than corn? Like wheat, barley, or another grain? Tennessee, West Virginia, and Kentucky have the same sort of climate as Nevada has now, maybe drier. I've seen maps, and pictures and graphs. It's not hard to find a temperature projection. But things like the drought severity index tell me it is drier than normal (whatever and whenever normal was defined) for a certain area. Iowa in a drought is still a good bit more moist than Nevada in a normal year. I'm most interested in seeing projected inches of rain per year in an area, along with the temperature readings. And maybe a helpful tag like, "This area's projected climate is most like current day (2012) Arizona." I see these things and I am concerned. But what does it actually mean? A dust bowl in Minnesota? Minnesota become prairie? Minnesota has a climate like Greece or Turkey? I think I can understand why scientists don't want to make detailed predictions (though I think it could be extracted from the material they publish), they could be wrong or someone could accuse you of sensationalism. But a Palmer Drought Severity index is a little abstract if you want to get the average college graduate even concerned about this issue. "However, one story you might try .. suppose climate change makes the weather less correlated ... you get a hot week or three and then a bunch of rain and cooler weather and then back again." So Chaco Canyon is the 'hopey-changey' scenario? Ouch! I can't recall the exact quote, but Stuart says Hopi people expect American 'civilization' to disappear in a generation or two. Seth - book added to the wishlist! My understanding is that most Native Americans thought the white man was insane and that it would all end badly ever since they first encountered us. But specifically yes the Hopi have been prophesying disaster for most of the 20th Century (eg I understand they sent a delegation to an early meeting of the UN to warn of it). Sunbeam - your point is well taken but I simply don't think the climate models are good enough yet at modeling drought to be able to say with confidence exactly what the impact will be where. I don't really trust any of these maps. I believe "there will be far more drought overall" and even "it will be worst in the places that are semi-arid now" but I don't necessarily believe the exact regional distribution or the quantitative predictions of the models. Hopefully the science will improve. With thanks for an excellent blog. There's considerable variation in the pictured model outputs (grey lines). Just approximating what they say for 2012, one model seems to be saying that the proportion of the US and Mexico with PDSI <2 is close to zero. At the other end of the spectrum it's somewhere between 60 and 70%. So the comfort I take is that the predictions are pretty uncertain. Seth - wow thx! This wishlist thing is cool :-) The book looks extremely interesting. Porsena - I think that's right. It's worth saying a little about your comment in re Joe Romm. I used to subscribe to Climate Progress but stopped, despite the fact that it sometimes had useful coverage of important climate papers, because I became irritated by the tone, but more importantly by my sense that the fundamental project of that blog is to be a partisan for the idea that climate change is very serious and important and society needs to take it much more seriously and address it (preferably through rather left leaning approaches). I felt that the blog is often not terribly careful about whether the particular pieces of evidence it uses to advance that agenda are actually correct or not - anything that supports the idea will be presented (often with a good deal of hype/spin) and anything that opposes, or even suggests uncertainty, will be rubbished. Now, I certainly agree that climate change seems to be a very serious issue and the facts as best we know them justify taking resolute action, even in the face of the residual uncertainties. However, what I strive to do on my blog is to tell the truth, to the best of my ability, about whatever it is I'm talking about. I may at times fail in this due to various inadequacies of ability, knowledge, and character, but that is very much my highest conscious value. So I try hard not to use arguments or authorities that I think are not correct, even if they would support some larger goal that I think desirable. And it bothers me when I perceive others to be doing so. in this sense RealClimate is an excellent source of climate change related problems from climate scientist, but there are many others -- Joe Romm is indeed quite extreme in some ways but one can always check the original articles/sources. My opinion is that the later we start to do *really* something about climate change, the worse for us/our children. "Now, I certainly agree that climate change seems to be a very serious issue and the facts as best we know them justify taking resolute action, even in the face of the residual uncertainties. However, what I strive to do on my blog is to tell the truth, to the best of my ability, about whatever it is I'm talking about. I may at times fail in this due to various inadequacies of ability, knowledge, and character, but that is very much my highest conscious value. So I try hard not to use arguments or authorities that I think are not correct, even if they would support some larger goal that I think desirable. And it bothers me when I perceive others to be doing so." IMO Stuart, it is safe to say that your sentiment expressed above is the reason that keeps many of us coming back to your blog. Those who eschew agendas, who are truly in search of and interested only in the truth, appreciate your efforts here. Thank you. Alex - agree on the general excellence of RealClimate but unfortunately the frequency of posts there has fallen way off. A lot of posters here still seem to have one foot in the technological optimism camp – i.e., we can find new hi tech to sort out our problems. 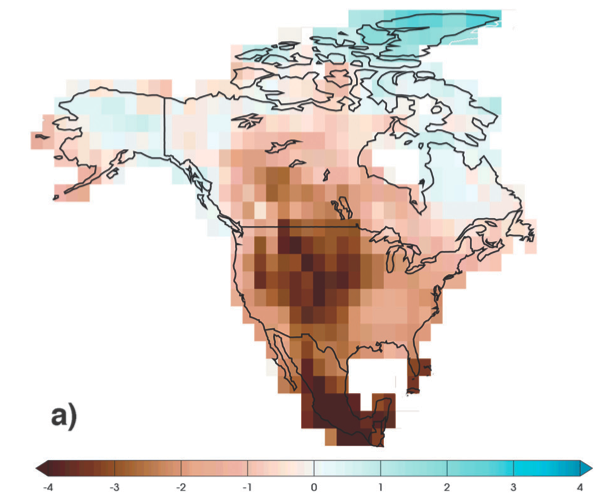 Although there is more drought in some regions, there is more precipitation in others, as a result of climate change. I agree that the droughts will be terrible where they are, but look at ie Bangkok - underwater most of this year, and legislators actually considering moving the capital, as more precipitation is in future with climate change. Disastrous impacts from both results. Susan - I agree there seems reasonably clear evidence of increases in extreme rainfall events, and presumably that will show up in the flood statistics (though my present understanding is it's not that easy to make the latter case solidly and statistically at present - there have always been extreme flood events, so the challenge is to show both that they are materially more common nowadays, and that the effect can be attributed to climate change as opposed to other more localized habitat changes - eg deforestation). Still, my current sense is that while the future does involve more extremes in both directions, overall the planet is becoming hotter and drier, and the leading impacts will come from that direction. Well your prediction for severe droughts has come true this summer - record levels of counties under drought conditions since 1988 and predicting to surpass. Maybe not the 1930's YET.